The eGovernment Masterplans set the tone and direction of digital governance technologies over a set period of time. There have been five eGov Masterplans so far: Civil Service Computerisation Programme, eGAP I (2000 – 2003), eGAP II (2003 – 2005), iGov 2010 and eGov 2015. 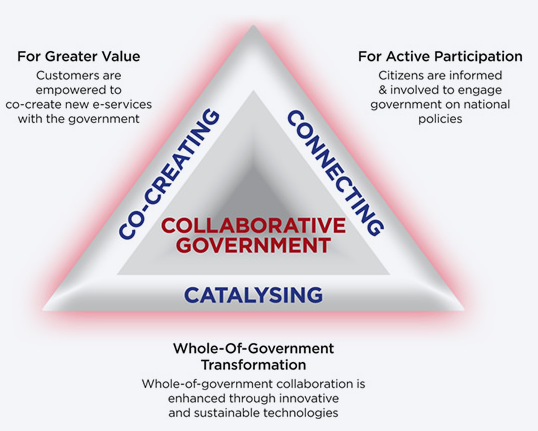 The focus of eGov 2015 shifted the delivery of Government e-services from a top-down “Government-to-You” system to a “Government-with-You” approach. This approach encouraged greater co-creation and interaction between the Government, citizens and private sector to create better solutions for the country and its people. Full detailed PDF of the eGov2015 publication. 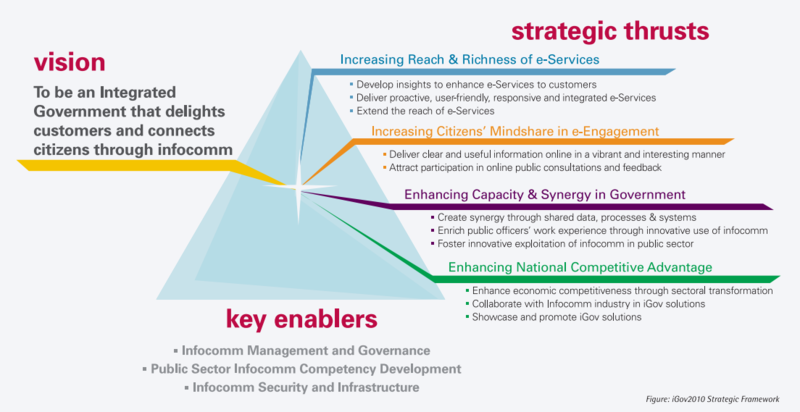 iGov 2010’s primary goal was to achieve a more integrated government through the use of infocomm technology. In order to achieve this, backend processes were integrated across agencies, allowing them to provide a more customer-friendly service delivery. Efforts were made to develop insights into the needs and preferences of the customers, and to anticipate their needs in order to increase the richness of e-Services. The reach of e-services was also extended, with steps taken to provide citizens lacking in access to the Internet with the facilities to do so. Full detailed PDF of the iGov 2010 publication. eGAP II set out to achieve a networked government that is able to deliver accessible, integrated and value-added e-services to the country’s customers, and in turn, help bring citizens closer together. Full detailed PDF of the eGap II publication. Full detailed PDF of the eGap I publication. The Civil Service Computerisation Programme (CSCP) was started with a focus to improve public administration through the effective use of ICT. The early days of the programme were primarily simple processes that would improve efficiency, such automating work functions and reducing paperwork. Over time, data was converted to digital formats, by the turn of the early 90s, emphasis shifted towards the consolidation of computing resources into the form of a shared data centre and a civil service-wide network.